This "Red Mountain" is the lower of two peaks that make up the Red Mtn. ski area. (The other peak is Granite Mountain, about 3 km to the northwest. Extensive mining in the early 1900's has left large areas of open pits on the west side. The LeRoi gold mine was the most productive in Canada. 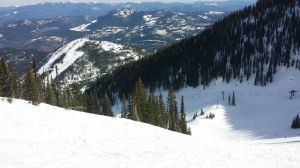 Red Mountain was the site of the first Canadian downhill championships in 1897, and the first chairlift in Western Canada, in 1947. The present chair looks and feels like it might be the original.